Despite Connie Britton’s departure, CMT has renewed its Nashville TV show for a sixth season. The country music television network famously rescued Nashville last year, after ABC cancelled the drama series. In addition, season 5B will premiere on Thursday, June 1, 2017 at 9:00pm ET/PT. Stars Charles Esten and Hayden Panettiere made a video announcement about the renewal. Check it out, below. Nashville also stars Clare Bowen, Sam Palladio, Chris Carmack, Jonathan Jackson, Lennon Stella, and Maisy Stella. Rachel Bilson and and Kaitlin Doubleday are joining the cast in the second half of season five. Also, Jeff Nordling will recur as record label owner, Brad Maitland. Learn more from this CMT press release. NASHVILLE – April 10, 2017 – CMT today announced “Nashville” will return for a new season with 16 episodes premiering early next year. In addition, the network revealed a midseason premiere date of Thursday, June 1 at 9 p.m. ET/PT. Charles Esten (Deacon) first announced the renewal on Facebook Live on behalf of the entire cast. In the coming weeks, CMT will announce its complete 2017-2018 slate. Long-time SVOD partner Hulu will continue to stream episodes the day after they premiere on CMT. The devoted “Nashie” fan base has generated record-breaking numbers for CMT. “Nashville” ranks as the network’s highest-rated and most-watched show in the network’s history, averaging 2.1M weekly viewers (L+7). Over the course of the first-half of the season, the series notched nearly 16 million total viewers on CMT alone, and nearly 23 million on CMT and Nickelodeon. The news comes on the heels of strong growth for CMT. Original premieres are pacing up 51% among A 18-49 and 79% among W 18-49 versus year ago. Total day ratings are up 19% with A 18-49 and 25% with W 18-49. As a result, CMT garnered the biggest year-over-year growth this quarter than any other top 50 channel on cable (excluding news nets). Rachel Bilson (“The OC,” “Hart of Dixie”) and Kaitlin Doubleday (“Empire”) will join the series in the second half of season five. In addition, fresh off the success of “Big Little Lies,” Jeff Nordling will recur in the role of Brad Maitland, an extremely successful, charming, egotistical, narcissistic owner of the most successful record label in Nashville. The midseason premiere picks up 10 weeks after the events that unfolded in the midseason finale. Deacon helps Daphne with a school project, but Daphne feels unmotivated. Juliette gives Maddie unsolicited advice about a song. Scarlett and Gunnar receive news about the baby. For a preview from Marshall Herskovitz, executive producer and show runner, click here. 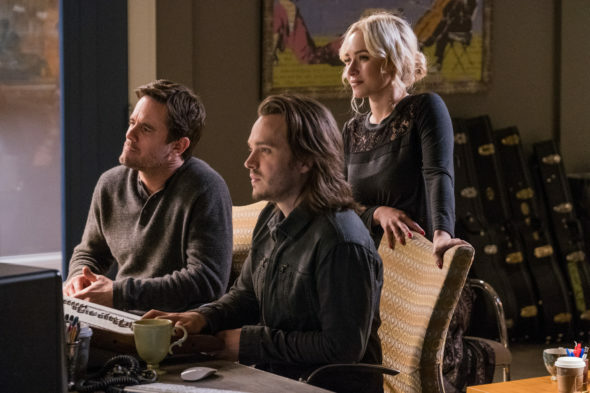 “Nashville” stars Hayden Panettiere as Juliette Barnes, Clare Bowen as Scarlett O’Connor, Chris Carmack as Will Lexington, Charles Esten as Deacon Claybourne, Jonathan Jackson as Avery Barkley, Sam Palladio as Gunnar Scott, Maisy Stella as Daphne Conrad and Lennon Stella as Maddie Conrad. In addition, this season features Joseph David-Jones as Clay, Rhiannon Giddens as Hallie Jordan and Cameron Scoggins as Zach Welles in recurring roles. “Nashville” airs in 225 territories worldwide. Since its debut, the show has inspired 10 soundtracks, including a Christmas album, which have collectively sold more than one million album units and over 5 million single-track downloads to date. It has also been nominated for multiple Emmy, Golden Globe and Critics Choice awards. CMT, a unit of Viacom Inc. (NASDAQ: VIA, VIAB), is the leading television and digital authority on country music and entertainment, reaching more than 92 million homes in the U.S. CMT, CMT.com and CMT Radio offer an unparalleled mix of music, news, live concerts and series and are the top resource for country music on demand. The network’s digital platforms include the 24-hour music channel, CMT Music, CMT App, CMT Mobile and CMT VOD. What do you think? Are you still watching the Nashville TV series? Should it have been cancelled or renewed for season six on CMT? I love Nashville! I never thought I would or that the show would work. Boy was I wrong. The quality of all involved is amazing. Please continue with the show.